Have you spent another evening looking online at properties? Do you know every existing property that’s on sale in your area off by heart? Well then you are not alone. With house prices to increase by at least 8% in 2017*, demand is high. Yet figures from Daft.ie, show that there were just 21,700 properties for sale nationwide at the end of 2016. Figures aren’t in yet for the 2017 yet, but we’d bet its a similar position. So if you see a house, then you need to be ready to go. You need to be ready with your deposit and your solicitor’s details. 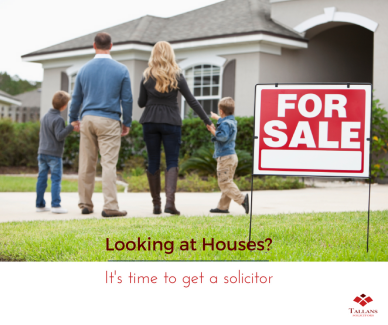 As soon as you find your ideal home and your offer is accepted, one of the first questions one of the first questions the estate agent will ask you is for your solicitor’s details. They will then pass them onto the sellers’ solicitors. Here at Tallans, we’ll advise you when making an offer to always say your offer is subject to contract and survey. What you’re saying is that yes, you are offering to pay this amount provided there are no legal or structural issues with the property. That is so important. So contact us either at Drogheda on 041 9838708 or Ashbourne on 01 835 2027 today. We’ll have a conversation so you’ll be ready to go. By the way – Have you seen our new brochure yet? It explains everything you need to know about buying a house – from a legal perspective. Email us drogheda@tallans.ie or ashbourne@tallans.ie for a copy or pop into our offices and pick one up at reception. Previous PostDivorce, Legal Separation, Judicial Separation – What’s the Difference? Next PostWhat is Guardianship of a Child?